Welcome to the Parish of Neston. We hope you will find what you are looking for within these web pages. But first, let us introduce you to some facts and information about our beautiful and fascinating Town and Ancient Church. Firstly, the town of Neston can be traced back to pre Doomsday Book with evidence of a Viking settlement, and was one time, the biggest port in the North West serving Atlantic routes before the Port of Liverpool was founded. Ships sailed from Neston to Portugal, Spain, France and Ireland, and indeed were part of the lucrative cotton / slave trade elsewhere. As a result direct links existed between Neston and London and North Wales. It became a huge coaching town with all that such a place provides. For a short period coal mining became an industry around the area producing high quality coal from narrow seams mainly protruding under the Dee estuary. Many old traditions are kept in the town one of which is the only surviving ‘Ladies Walking Day’ which is strongly linked to the Neston Female Friendly Society. This extends back to times before the Napoleonic Wars. Neston Parish Church is situated in the centre of the Town of Neston (on the Wirral) in the Diocese of Chester. It is dedicated to St Mary the mother of Jesus and St Helen the mother of Constantine the first Christian Roman Emperor and is unique in the Anglican Church and can claim the first record of a stone church building going back to the 1100s. It was re-built in the gothic revival style between 1874 and 1875 on the site of the previous Norman church of the 12th Century. However, it is believed that this has been a worship site from much earlier times as indicated by the remains of grave marker crosses, dating from 930AD, which were found under the foundations of the old Norman church. 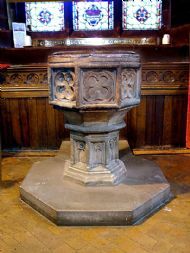 The font in which Lady Hamilton, mistress of Lord Nelson was christened. The original Charter of the Female Friendly Society. Morris, Byrne-Jones, Hardman, Kempe and many others. Viking stones with a unique carving depicting Vikings fighting on horseback. The Falklands Chapel rescued from HMS Plymouth prior to its demise. The church is open for viewing daily and a small shop provides products for sale found nowhere else in the town. The church was the first recipient of the much coveted North West Multi Faith Tourism Award. 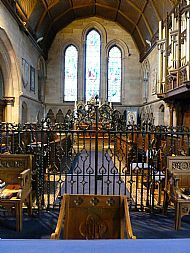 There are 14 services per week held in the church and is renowned for being a place of reflection as it is open daily between 8.00am and 3.00pm for private prayer. Bless, O Lord, the work of your Church in this place. your gospel proclaimed, your grace received. and joyful in your service.